For many reasons this comment has stuck with me most in the aftermath of George Zimmerman’s aquital in Trayvon Martin’s death: “Michael Vick got two and a half years for dog fighting. George Zimmerman gets nothing for his part in the death of Trayvon Martin.” Many people have said something like this, and many more have said America’s justice system needs to be reformed. But how? Given the very nature of law—as currently conceived—it would take a sea change of monumental proportions, and law cannot ultimately save us anyway. What occupies much of the legal process is determining what can be “set aside”—what parts of the real life situation one can, or must, weigh more lightly or ignore all together. Paradoxically, then, law often adjudicates a version of life that sometimes only faintly resembles the original situation. It does so to retain some measure of “objectivity” or “neutrality”—something even the hard sciences have questioned profoundly for over a century. When it comes to law, many question this “neutrality” as well. Who seriously believes, for example, that politics and ideology play no part in the Supreme Court, where we regularly speak of conservative vs. liberal? Of course, each side—especially the conservative side—believes it’s being objective while the other side isn’t. It was easier to convict Michael Vick simply because it was easier to actually set “race aside” in his case. It wasn’t that easy in Trayvon Martin’s. Most Americans have gone along with the legal decision, however, because putting “race aside” is perhaps the deepest wish of the American people. I have said many times that Americans would rather talk about anything but race—anything. ”Do you have to bring race into everything?” is our favorite, dismissive question. Sometimes the question makes sense, though in the U.S. it never makes complete sense because, as many have said, racism is our original sin, something woven into—not just stamped on to—the fabric of our national being from the time of the Pilgrims. With the election of Barack Obama, many Americans believe—despite absolutely overwhelming evidence from virtually every area of daily life—that we have entered a “post-racial” age. Behind this is the fervent belief in colorblindness. In the late 90′s, I presented a diversity plan for a prominent Illinois school district at several community town hall meetings, where I was hit over and over and over again with the bat of colorblindness. * The swinging of that bat has to stop. Someday we simply have to look at the evidence—again, it’s overwhelming—and admit color matters. So far, however, the idea of colorblindness usually prevails, even for many people of color. For example, at a forum on racial profiling at my own college just a few days ago (July 23, 2013), one panelist, a member of the NAACP national board and an actual A.M.E. church minister—in other words, someone who should have known better—said, “Justice is colorless…A lot of people are emoting about Trayvon Martin. We need to get beyond the emotions.” Here our cultural wish for colorblindness sanctifies our legal pretense of race-neutrality. It is “the dream of all liberal men,” James Baldwin wrote, “to join hands and walk together into that dazzling future when there will be no white or black…a dream not at all dishonorable [my emphasis], but, nevertheless, a dream. For, let us join hands on this mountain as we may, the battle is elsewhere. It proceeds far from us in the heat and horror and pain of life itself where all men are betrayed by greed and guilt and bloodlust and where no one’s hands are clean.” In the heat and horror and pain of life itself George Zimmerman confronted Trayvon Martin. The real battle is there. And there you can bet he—like virtually everyone who’s killed an unarmed black man—saw color, even though law continues to hold to the belief that he didn’t. * The diversity plan was for Naperville Community Unit School District 203, Naperville, IL. Go Here to read more and see the pamphlet mailed to each household in the district. ** Go to the TEACHING DIVERSITY main page, and to an article about the shooting of yet another unarmed black man, Stephon Clark. 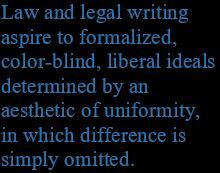 This entry was posted in Diversity & Multiculturalism, Reviews & Commentary, Social Change and tagged colorblindness, George Zimmerman, Patricia Williams, race-neutrality in American law, The Alchemy of Race and Rights, Trayvon Martin. Bookmark the permalink.